As kitchen gadgets go, it's tempting to think that anything other than a standard grater would be firmly put into the 'nice not necessary' pile. You have a box grater and a knife and that's all you need, right? Well, yes and no. While good kitchen knives are great investments, they can get really pricey. You need to keep them in good nick. This means hand-washing them rather than chucking them in the dishwasher for a start. Sharpening them regularly is also critical, and for that you've got to know how to use a steel properly, because blunt knives are dangerous (and crap for chopping). Also, how's your knife technique? If you're making a dauphinoise, for example, it's going to cook through more thoroughly if you have equally sized pieces of raw spud lining the dish. For that, there's nothing better than a mandolin. Soooo much faster than using a knife, too. Showing how shallow I am, it also looks more impressive. We have this beast of a thing, the Oxo Good Grips Mandolin (£55 from John Lewis) and it will probably last longer than we will. It cuts various thicknesses and can also cut fancy-schmancy things like matchsticks and has an industrial holder (the black thing in the photo) that you use to hold the potato/cucumber/whatever as you merrily reduce it to ribbons and retain your fingers. Less of an investment, there's the hand-held version which I'm sure would work just as well - it's £10. Probably a more sensible starting point. Then slice away to your heart's content, for making apple tarts, or a million carrot sticks. 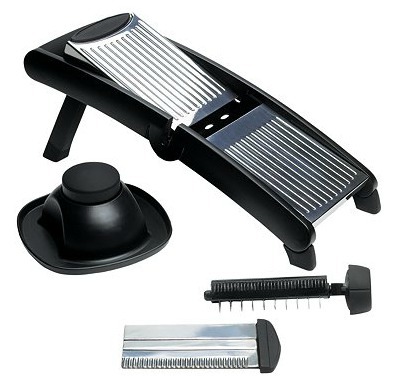 For grating, there's still nothing wrong with the old box grater but I used to find that as much of the food I was trying to process would stay inside the damn thing as end up on the plate. Lemon or lime zest made a particularly horrible mess. 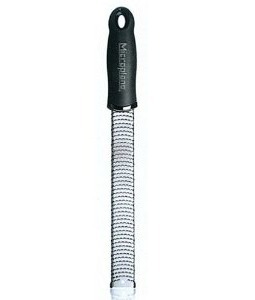 Microplane graters are virtually indestructible. This one is ideal for hard cheese like parmesan, for nutmeg and lemon zest, and also for decorating with a dusting of chocolate. This zester is £16.25 and you can also choose coarser ones that produce wider ribbons but they probably do stray into pure gadget territory. Also if you're lucky enough to have any kind of food processor already, investigate whether you can buy spare grating and slicing attachments for it if you think you'll really get the use out of it. Of course, that's a lot more washing up than a humble grater.